There are some days when the news gods smile on satire writers like me, and today is one of those days. I heard a news story so good that I wish I could say I had made it up. But I can’t because, sadly, it’s all true. There’s a sticky situation going on for the Quebec Maple Syrup Federation. Yup, Even saying there’s a syrup federation sounds delightfully made up, as if this were OPEC or the Rebel Alliance. But, with syrup going for $1,800 per barrel, or about 13 times the price of a barrel of oil, the maple syrup heist is nothing to laugh at. You can read the entire story of syrupy intrigue here, but in the meantime here’s the sticky details. Earlier this year an audit of the Global Strategic Maple Syrup Reserve (Yes! There really is a strategic maple syrup reserve!) revealed 6 million pounds of the sweet liquid were missing, replaced by empty barrels or barrels containing water. The investigation eventually led to a tale of skullduggery involving a leading syrup producer in New Brunswick, Etienne St. Pierre, Jacques Leblond, and a host of others that sound like the extras from Les Misérables. Fortunately, in the latest development, the thieves have been pancaked, with several arrested and some of the missing syrup recovered. 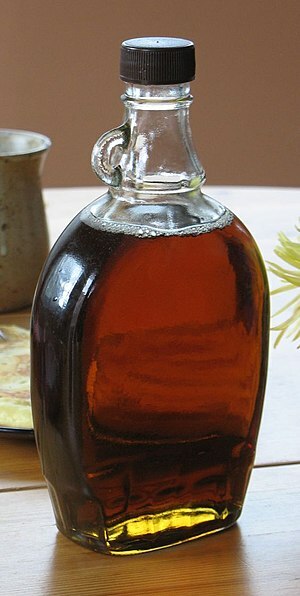 But the drama continues as syrup officials are unsure how sales of the stolen syrup will affect the global syrup market, and concerns from Quebec over continuing control of the syrup cartel. And we thought nothing interesting was happening in the news this week! This entry was posted in Random Thoughts and tagged Global Strategic Maple Syrup Reserve, Humor, Les Misérables, Maple syrup, Quebec, Quebec Syrup Federation, syrup satire, Theft by Huffygirl. Bookmark the permalink. 🙂 Yes, what a flap(jack) over syrup! I laughed all the way through this.Holy Cow! Glad I could make you laugh LN. I heard the news story while I was in my car, and was writing this in my head all the way home. Just too good to pass up. I read about this– reminded me of the stories about stolen bales of hay out west. Good post- satirical but true. Nice new look to your blog- love the bird photo. I’ve been trying to get some pix of our birds at the feeders but they don’t cooperate. Thanks Lisa. I finally bit the bullet and updated my theme – I’m happy with it so far. I have to put out the suet to bribe them to come, so I can’t do that. Well if it’s coming down to chocolate chip cookies, or for that matter, anything chocolate, than it’s really becoming serious. Syrup I could live without if I had to, but chocolate? I think not. Thanks for stopping by. You had me chuckling through this one, HG, although it’s no laughing matter for the maple syrup producers, given the large amount of cash that the sticky-fingered product represented, i.e., between $18M and $30M (accounts differ). Btw, if I ever need a dose of purply goodness, I know where to come :P. Nice job! Thanks for your kind words Sandra. As you know by now, I’m a big fan of Canada, and find all Canadian news intriguing, but this one takes the (pan)cake! I read your story with horror, HG! Go ahead and poke fun at this sticky situation, but you fail to understand the ramifications for those of us addicted to a daily fix of this amber gold. I use it in my oatmeal, in my yogurt, on my biscuits, and, when nothing else is available, I chug it from the jug. No more gasoline for my car? Ha! I’ll walk. A dearth of maple syrup? How would I survive? So glad the perps were caught. Does Canada have the death penalty? Loved your humor and the bird picture. No wonder syrup is so expensive – they know there are lots of people out there with SAS who are willing to pay any amount. Glad you liked the bird photo – I’m trying to brighten things up a bit with the change of the new year. Aaagghhhh! Now that you have put a name to my addiction, I feel even worse! I think you should. Also, you may want to see if you can join the syrup cartel – they fix the prices so sellers get more for their syrup. So, my sister’s family has a little maple syrup operation in northern Wisconsin. I’m thinking they need to expand and start transporting it over the line. Maybe the laws won’t permit, but I’m sure if Canadians are missing their amber nectar of the Gods, there will soon be a black market. I’ll give my sister a heads-up. Anyway…. love the post. Laughed out loud! 😉 Thanks! Thanks Patti. That might be a lucrative deal for your sister, IF she is able to avoid any unfortunate repercussions from the Canadian cartel. With all the syrup intrigue, it sounds a lot like the syrup Mafia, and you definitely don’t want to get in bed with them. Although I’ve never understood the whole gravy on fries thing, I think it actually is kind of yummy. But then they ruin it by adding peas. Maybe my blogger buddy Sandra can shed some light on this for us. Sounds like they love you too John. I’d rather read about this than the “Much Ado About Nothing” flap about Mante Teo. That’s all the S.B. media can talk about. Now, syrup–that’s something I can sink my teeth into! Oh Canada, indeed! Why thank you. Canada seems to bring out the best in us, I think. Maybe we can send Mante Teo to Canada to reform him. Thanks Martin. I think if sugar were a controlled substance, I would be writing this blog from prison, so I hope that doesn’t happen. How’s the biking by the way? LoL – Thanks for asking! Struggling… Caught a very bad cold in late October that I couldn’t shake until Christmas. Just starting up again. Well, keep plugging away at it. Maybe when the weather is a little better. Here in Michigan most of the time we can’t do any biking in the winter. I’m relegated to riding my bike on a trainer in the basement, or going to spin class at the gym. Both are pretty boring.